Get Organized: Wire management for your stereo. CORD CONTROL KITS In the Cord Control Kits you'll find the perfect combination of wire-management components to organize your stereo's messy cords, cables and wires. Superflex Tube: At the core of the Cord Control Kits is our unique Superflex slit plastic tubing that conceals the mess. The full length slit allows the cords to enter and exit the tube at any point so all you see is the last inch or two of cord. Each Kit also contains 32 Color Coded Labels (see below) for the cord ends and jacks. With these labels anyone can hook-up the most complicated equipment by simply matching colors. The 6 versatile and Reusable Beaded Ties bundle up any cords that are left outside the tube. The best Kit for most stereos and home entertainment centers is the new Just Right Cord Control Kit. The 8 foot long,1 1/4 inch tube holds up to 40% more cords than our Standard Kit. 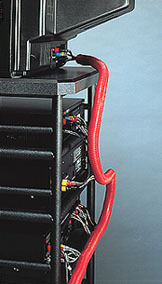 If you have a really large system you'll need the Big Tube Kit which holds twice as many cords as the Standard Kit . These Kits are available with either black, white, or light gray Superflex Tube. Our simplest and most popular labeling system. 16 self-adhesive rectangles label the cord ends. 16 circles label the cord jacks. Together they make it easy to reconnect the most complicated equipment by simply matching colors. Note: We used the red tube in the picture just to make it stand out.